This volume contains a complete transcript of the only surviving minute book of the Chesterfield Canal Company, covering the period of the canal&apos;s construction in the 1770s. Originally planned by James Brindley, the leading engineer of the early canal era, the project was completed by his pupil John Varley and brother–in–law Hugh Henshall. Extending 46 miles from Chesterfield to the Trent at West Stockwith Notts., the scheme was among the most ambitious of its period and included, at Norwood near Killamarsh, what was then the longest canal tunnel in Britain. The minute book records meetings of both the committee that managed the project from day to day and also the six–monthly shareholders&apos; general assemblies. 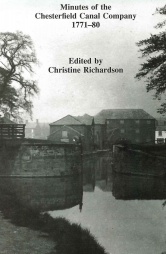 The minutes trace the development of the canal from immediately after it secured parliamentary approval until about three years after it was completed, and at the same time shed a good deal of light on the economy of north–east Derbyshire north Nottinghamshire. Numerous local landowners appear in the book, as do the engineers and contractors who built the canal.